“Ship and Scrimshaw,” by Ralph Cahoon, 1966, oil on Masonite, is the gift of Clare and Robert Dudley Harrington Jr. Ralph’s love of ships and the sea shines through in this large ship portrait, set within a border strikingly embellished with trompe l’oeil seafaring objects; it also features a sextant, which was likely painted directly from life as Ralph owned an impressive collection of maritime antiques. COTUIT, MASS. – The Cahoon Museum of American Art has opened its Summer season with an exhibition that highlights contemporary art, traditional American art and New England craft traditions. 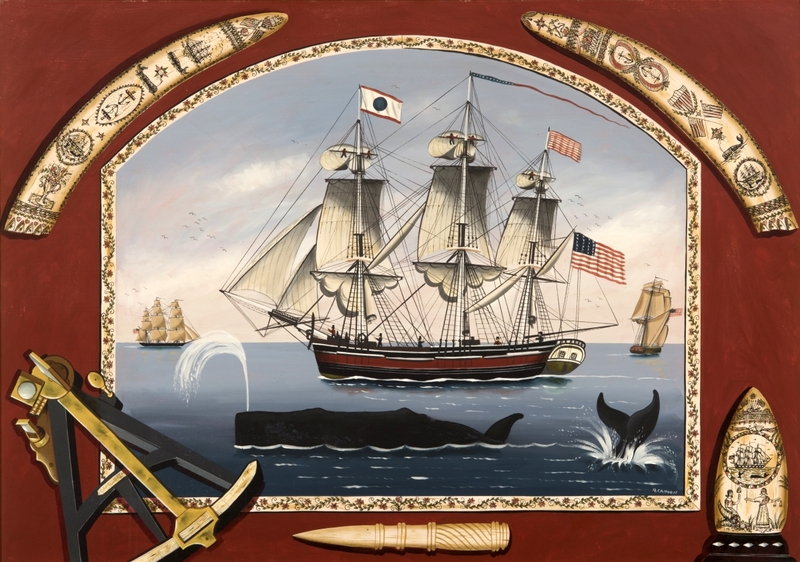 On view at the museum through December 22, “Scrimshandering: Ralph Cahoon, Scrimshaw, and Nantucket Whaling Heritage” details the passion and impact that the American nautical folk art of scrimshaw had on artist Ralph Cahoon (1910-1982), who incorporated scrimshaw themes into his paintings. 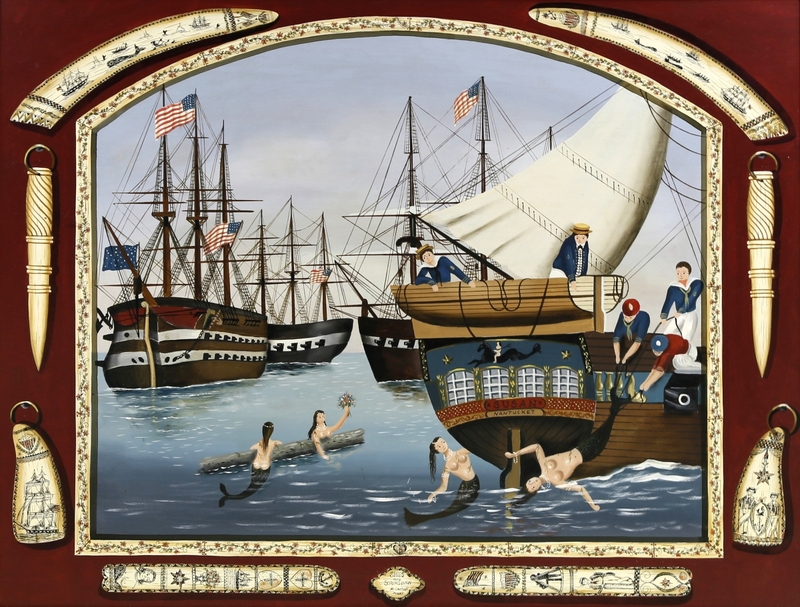 Cahoon had a deep interest in scrimshaw, the American nautical folk art that developed alongside the whaling industry during the first half of the Nineteenth Century, when hundreds of whaling vessels roamed the oceans of the world carrying many thousands of American sailors. 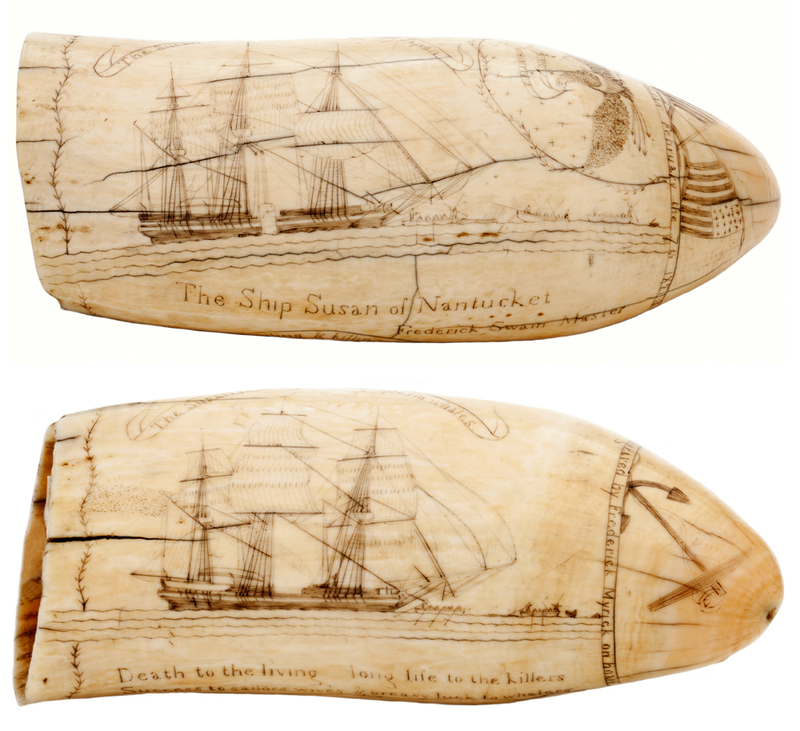 Scrimshaw refers to the art and craft of carving and engraving on bone or ivory. The parts of the whale that had little or no commercial value in the whaling industry – the hard byproducts – were given to the sailors for their own use. Sperm whale teeth could be polished to a high gloss, then engraved with pictures that were rubbed with lampblack or colored pigment for definition. Sailors also carved in relief or full round to produce sculptures of people and animals, finials, handles, tools, inlay and all manner of ornaments for wooden boxes, canes and other objects. Some images were drawn freehand, in particular those that drew from the sailors’ own experiences. Others were copied by pasting a drawing or a print over the surface and then pricking an outline through the template. Clark G. Voorhees Jr’s father — a landscape painter — founded the Old Lyme Art Colony in Connecticut. Clark followed in his father’s footsteps by attending the Art Society of Hartford, but it was not until he later entered the Navy that he began carving whales. 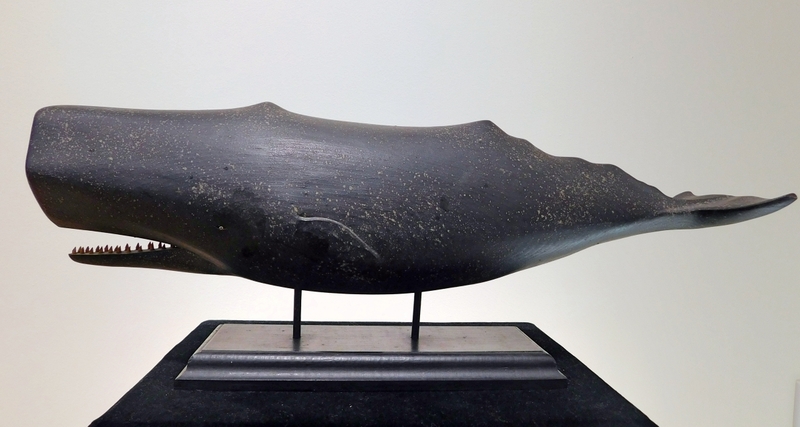 This full, wooden-body carving of a sperm whale, mounted on a custom stand, belonged to Ralph Cahoon. The sea was a major influence on the designs, especially portraits of the ships and vessels on which they spent so much of their time. Many examples focus on a ship amidst a hunt and include the animals being hunted. Marine-themed myths and legends inspired sailors. Depictions of fashionable ladies, often copied from magazines or books, were also popular subjects, and so were portraits of loved ones at home. 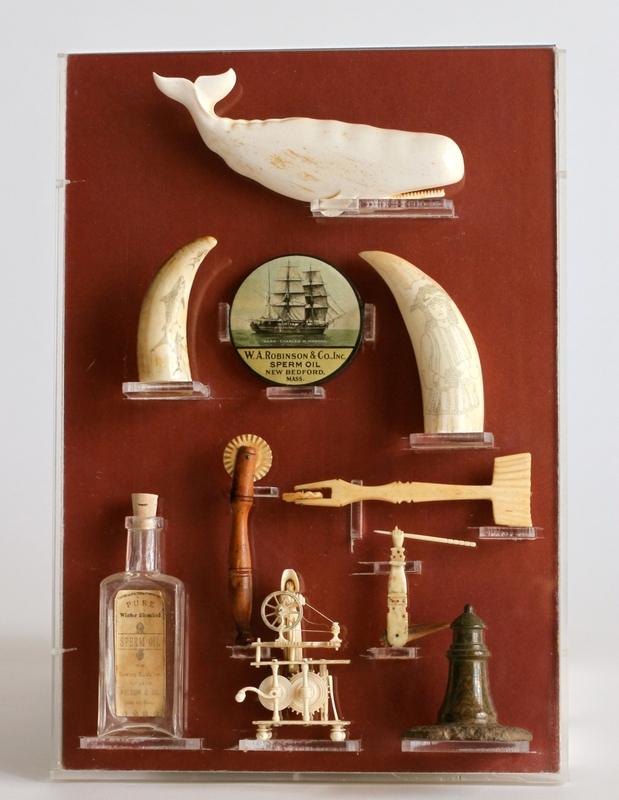 Included in the exhibit are an example of a faux-scrimshaw replica ditty box engraved and painted by Ralph Cahoon, a Clark Greenwood Voorhees carved whale, nautical antiques, a whaling ship logbook and examples of various types of scrimshaw, including a rare 1829 whale’s tooth from the Nantucket whaling ship Susan on loan to the Cahoon Museum from the Nantucket Historical Association. The museum is at 4676 Falmouth Road. For information, www.cahoonmuseum.org or 508-428-7581. “Ditty Box,” synthetic whale bone, ink. Collection of the John and Marjorie Ferguson. Ditty boxes were used by sailors to hold their odds and ends. Examples of whalebone ditty boxes have polished baleen or whale bone sides bent to the shape of an oval bottom, to which the baleen or whale bone is fastened with copper nails and fitted with a wooden top. Ralph honored this tradition in his replica ditty box.